The front page of the Palm Beach Post’s sports section had an article and a column about Kiffin’s departure for USC. I’m a history buff and used to follow college football much more seriously than I do today. As I drank my coffee I thought of a former TN Volunteer coach who left the school for another football program. His name was Doug Dickey. I did a google search after I finished breakfast, and found this article written by Randy Moore. Lane Kiffin’s sudden decision to leave The Hill in favor of his previous college coaching stop (Southern Cal) has created the same mixture of shock, dismay and outrage among Volunteer fans that arose when Dickey bolted in ’69 to take the reins at his alma mater (Florida). - Dickey was a former college quarterback (Florida). Kiffin was a former college quarterback (Fresno State). - Tennessee was Dickey’s first head coaching job at the collegiate level. Tennessee was Kiffin’s first head coaching job at the collegiate level. - Dickey was an “outsider” (a non-UT grad) who followed two UT grads (Harvey Robinson, Bowden Wyatt) as the head coach. Kiffin was an outsider who followed two UT grads (Johnny Majors, Phillip Fulmer) as head coach. - Dickey had incredible support from Tennessee’s administration and fan base. Kiffin’s support from those same groups was no less incredible. - Dickey surrounded himself with outstanding assistants who excelled as recruiters and teachers. Kiffin surrounded himself with outstanding assistants who excelled as recruiters and teachers. - Dickey was a radical departure from his predecessors, shifting UT from the single-wing to the I-formation and lobbying for artificial turf (dubbed Doug’s Rug). Kiffin was a radical departure from his predecessors, as well, making national headlines with his brash comments and lobbying for black jerseys on Halloween. - Dickey went 4-5-1 in Year 1 but raised Big Orange hopes by playing third-ranked Alabama to a 19-8 loss and playing seventh-ranked LSU to a 3-3 tie. Kiffin went 7-6 in Year 1 but raised Big Orange hopes by playing top-ranked Alabama to a 12-10 loss and playing top-ranked Florida to a 23-13 loss. - Dickey closed his Tennessee run with a 14-13 Gator Bowl loss to 14th-ranked Florida. Kiffin closed his Tennessee run with a 37-14 Chick fil-A Bowl loss to 12th-ranked Virginia Tech. - Dickey’s departure led UT to promote receivers coach Bill Battle to the top job. Kiffin’s departure led UT to promote receivers coach Kippy Brown to the top job (albeit on an interim basis). Those are an awful lot of similarities. Both coaches last game was a Florida located Bowl appearance. Yeah, y’all got jilted. It hurts. It happens. Both ways. Vol Nation didn’t exactly treat ol’ Phil Fulmer kindly by kicking him out the door after 17 mostly real-good seasons in making room for … Kiffin. The whole karma bit can get ugly. What goes around comes around. Tennessee should move on. Isn’t Volunteer football bigger than one man? Southeastern Conference coaches will face stiffer penalties from now on for complaining in the media about officiating. Commissioner Mike Slive told The Associated Press in a phone interview Friday that coaches who violate the conference’s ethics rules against criticizing officials in public will face a fine or suspension instead of receiving merely public reprimands when they first act up. “On rare occasions over the last seven years there were several private reprimands and that took care of the matter,” said Slive, in his eighth year as the SEC’s leader. “On occasion there were public reprimands and that took care of it. It became clear to me after last week that I was no longer interested in reprimands and the conference athletic directors and university presidents unanimously agreed. If I were the SEC, I’d concentrate on getting more professional officials to work their games rather than take action against coaches who criticize officiating. The SEC after all just suspended an entire football crew. I think the integrity of the league possibly being endangered by rogue officiating would be the more serious concern. The Southeastern Conference has suspended officials from last weekend’s Arkansas-Florida game after the crew was involved in its second controversial call of the year.Referee Marc Curles’ crew called a personal foul on Arkansas defensive lineman Malcolm Sheppard in the fourth quarter as the Gators were rallying for a 23-20 victory. The league said there was no video evidence to support the call. The same group of officials called the LSU-Georgia game earlier this month, which included a late unsportsmanlike conduct penalty the league said shouldn’t have been called. SEC associate commissioner Charles Bloom said this is the first time the league has publicly suspended a football crew like this. The SEC says the crew will be removed from its next scheduled assignment Oct. 31 and will not be assigned to officiate as a crew until Nov. 14. Conference officials went on to say this will affect referee bowl assignments. I sincerely hope it does. This crew shouldn’t be given extra opportunities to screw up. He took the Gators to three SEC Championships and was even a assistant football coach. RIP. Dave Fuller, the winningest baseball coach in University of Florida history, has died. He was 94. Pledging his commitment to Alabama for the rest of his coaching career, Nick Saban signed a contract extension Saturday that will keep him in charge of the Crimson Tide football program through the 2017 season. Saban, accused by some of being a coaching nomad and not willing to set down roots, said prior to last season that there were “no other horizons” for him in the coaching profession. This latest deal would appear to be another clear indication that he has dug in at Alabama. I never thought of Saban as a coaching nomad. His namesake, the late Lou Saban, was the ultimate nomad in college football coaching. Alabama officials had been working on a contract that would not change Saban’s base salary over the next several years, but would award him with a three-year extension, bumping up his total financial package to an average of more than $4 million per year. Saban is scheduled to make $3.9 million this year. His original eight-year contract was worth $32 million and escalated each year. He’ll go to $4.1 million in 2010 and is scheduled to make $4.2 million in each of the final three years of that deal (2012, 2013 and 2014). A long term contract locks in Saban in Tuscaloosa for a long time. It comes with disadvantages, which to me outweigh the advantages. A coach may underperform or bring scandal to the school. The University will then, and often with good reason, want to move on but are restrained from doing so because of the cost of buying out a coach’s contract. Alabama football fans, no disrespect to my friend and owner of this blog James Joyner, seem fickle to me. They want the Bear Bryant days back and when a coach doesn’t live up to these high expectations, they soon long for the next candidate. That is just my humble opinion. Alabama’s football program is getting spanked yet again by the NCAA,Â ESPN reports. The NCAA will reveal later Thursday that the Alabama football program must vacate victories from 2005 through 2007 that included players who improperly obtained free textbooks for other students, the Birmingham News is reporting. Alabama could be forced to vacate as many as 21 wins under the watch of former coach Mike Shula and current coach Nick Saban, sources at the university told ESPN.com’s Mark Schlabach. Citing a source, the News reported the number of wins to be at least 10. The Crimson Tide will not lose future scholarships, according to the News. The university also will be placed on probation for the second time in the past eight years and ordered to pay a fine, the newspaper reported. The NCAA alleges the violations began at the start of the 2005 season; the university reported the violations after uncovering them during the ’07 football season, when starting linemen Antoine Caldwell and Marlon Davis, running back Glen Coffee and defensive backs Chris Rogers and Marquis Johnson were suspended for four games. Under NCAA rules, the players would be ruled ineligible from when they first received the “extra benefits” and would have been ineligible until they were suspended and reinstated. It is not clear which additional sports programs at Alabama are affected. The NCAA’s ruling will be announced in a 3 p.m. ET teleconference. University officials aren’t permitted to comment until the NCAA releases its findings. The investigation also included athletes in other sports that the university has not disclosed. Alabama appeared before the Committee on Infractions on Feb. 20 to answer allegations of potentially major violations involving the improper disbursement of textbooks and “failure to adequately monitor” the textbook distribution process for student-athletes. The violations occurred during the 2005-06 school year and into the fall of 2007. That left the university subject to potentially stiffer penalties as a repeat violator because the football program was placed on probation on Feb. 1, 2002. The new case also reopens the five-year repeat violator window. 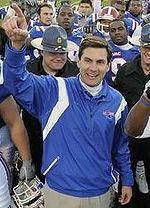 Saban replaced Shula as coach after the 2006 football season and suspended Caldwell, Coffee, Johnson, Rogers and Davis when the university uncovered the violations. The Tide was 5-2 at that point in the 2007 season and their only wins in the next six games came against Tennessee and Colorado in the Independence Bowl. The sanctions come at a time when Alabama fans were celebrating the program’s return to national prominence. Saban led the Tide to a 12-0 regular-season record and a No. 1 ranking last season, before the team lost to Florida in the Southeastern Conference championship game and to Utah in the Sugar Bowl. As an Alabama alumnus — I was enrolled when we won our most recent national football title in 1992 — I’m sick over this.Â Just as the program recovered from the last set of sanctions, here we go again. It sounds like Nick Saban is uninvolved and acted correctly here.Â If there are sanctions beyond losing past games, though, I wouldn’t be at all surprised for him to pull a Franchione and leave for greener pastures. As an aside, I think retroactive forfeits are silly.Â You can’t change history and it only penalizes fans, not students, athletes, or others responsible.